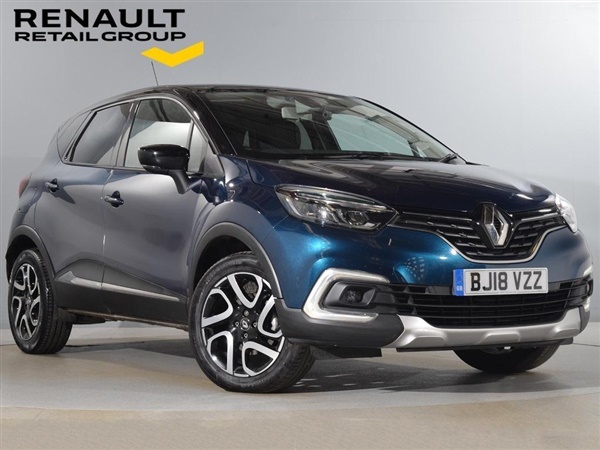 Metallic - Ocean blue, 400 Deposit contribution & 2 years free servicing with PCP Finance.This is a great example of a nearly new Renault Captur finished in eye catching Ocean Blue with contrasting Black roof. This Ex Ecop(employee car ownership plan)vehicle was previously on loan to a Renault employee and has been fully maintained and serviced by Renault Retail Group.Now you have the rare opportunity to purchase nearly new vehicle at a fantastic price when compared to the cost of a new vehicle.This vehicle is covered by the remainder of a Renault 3 year Manufacturers Warranty and roadside assistance from Date of First Registration.Next MOT due three years after the date of first registration.Renault London West is part of the Renault Retail Group. Renault Retail Group is 100%-owned by Renault we are leading supplier of new and nearly new vehicles. Renault London West is the best place to get a great deal on your next vehicle. Our showroom in Park Royal is conveniently situated just off the A40 and is close to numerous public transport links.We also offer a comprehensive range of aftersales options, including MOTs and servicing, manufacturer parts and bodyshop repairs. Get in touch with a member of the team by phone or using our online contact form to find out more., 7in Touchscreen, Alloy Wheels - 17in Explore with Black Inserts, Automatic Climate Control w.One Touch Demist Func., Bluetooth Audio Streaming and Hands-Free Calls, Cruise Control and Speed Limiter, DAB Tuner, Extra Tinted Rear Windows and Tailgate, Front and Rear Electric Windows, Hands Free Access with Key Card and Start Button, Hill Start Assist (HSA), MediaNav Multimedia System, FM/AM Tuner, Navteq Navigation, Rain Sensitive Front Windscreen Wipers, Rear Parking Sensors, Tyre Pressure Warning Light. 5 seats, Click Call Collect Today!